When it comes to the ultimate success or failure of a company, the most important lesson I’ve learned over the years is that management really does matter a lot. If you have a great company run by a poor CEO, the odds of that company turning into a good investment are low. On the other hand, if you have a so-so company in a so-so industry with a superb CEO, then it is much more likely that company will turn out to be a good investment. Focus on management, management, management — that is essentially the first rule of investing. For example, a colleague and I met with the CEO of a large Chicago company years ago, thinking they might have some interesting technology. I remember the CEO’s desk was extremely clean. There was nothing on it except a pencil holder and some perfectly sharpened pencils. Throughout the meeting, his assistant interrupted us three times with questions about production-line issues. I said to myself, “He’s a micro-manager and this company is too big to have a micromanager as CEO.” That’s all I needed to know. We decided not to invest. As it turns out, the stock went down a lot, the CEO was fired, and the company basically broke up because it was so mismanaged. If we hadn’t gone to that meeting and had that interaction, we might have invested in the company because it looked attractive on paper. Management was the problem. I’m not saying there’s anything wrong with perfectly sharpened pencils, but it was a classic micromanagement example. One very large and very clear problem today is the high level of debt that has accumulated over the years. This growing debt load is not isolated to any one corner of the economy. It is pervasive and widespread. 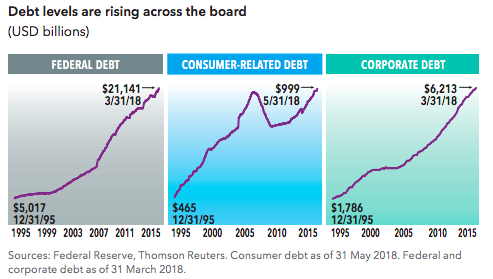 Government, corporate and consumer debt has grown dramatically at a time of historically low borrowing costs. In today’s ultra-low interest-rate environment, the cost of the debt looks very manageable. But when rates move higher — as they have started to do already — the cost is going to look more and more onerous. It’s a long-term issue that isn’t going to implode anytime soon, but I think it is a serious headwind for the global economy. Another lesson I learned early in my career at Capital is that we seek to take advantage of bear markets. Broadly speaking, declining markets give you a chance to invest in companies at lower prices. With my own investment style, I have tended to prepare a bit early for a downturn and then, when prices start falling, really use that bear market to take advantage of valuation opportunities. It’s not an easy thing to do. Some companies will come out stronger on the other side, and some will fall apart. You need to watch your portfolio companies closely to make sure your investment thesis remains valid. That said, in my case, some of my best investment decisions were not based on macroeconomic considerations. They were based on the fundamentals of each individual company. Sometimes in a down market, you get a chance to do well by identifying a great company at an attractive price. But more often than not, my best investment decisions came about because I was able to research and identify some fundamentally great companies and stay with them over a long period of time. The flip side of a bear market is the bull market we’ve seen since 2009, one of the longest in history. This exceptionally strong market has resulted in equity valuations that are high by any estimation. 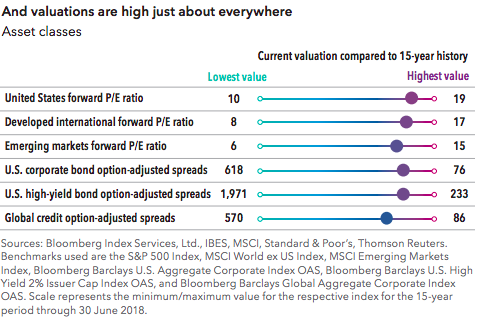 Whether you look at them on a price-to-earnings basis or relative to gross domestic product or just about any other standard measure, U.S. equities in particular are valued quite highly. That doesn’t mean the stock market is going to fall anytime soon. It just means you probably won’t see the extra tailwind of rising valuations as this bull market continues to age. That’s something investors need to keep in mind as they consider their total-return expectations going forward. In some cases, however, the high valuations are well deserved. Case in point: We are in one of the most exciting periods of innovation in my lifetime. When I started in this business, there were no smartphones and no internet. Over the past four decades, technological innovations have been enormous. And now we are seeing additional innovation in the areas of artificial intelligence, machine learning and social media. This extremely rapid pace of change creates a very disruptive environment, which is always exciting to me as an investor because opportunities emerge as things are disrupted. I remain very excited about these opportunities while, at the same time, keeping an eye on the potential headwinds in this extraordinary market environment. Gain insight into our history, philosophy, people, and unique approach to investment management - The Capital System - by exploring Capital Group in more detail. It’s ok for capital managers to interview and access managers but how do general investors like myself make a judgement on Ceo’s? Great question John. Livewire is working on a new podcast that aims to achieve exactly that. Keep an eye out for it. How do you assess a company's Chairman and Board of Directors, other than going to AGMs, watching a stage managed performance? Hi Nik, just to clarify... Are you after more content or are you saying you'd like more material in audio format? The Constant Investor is great for listening to CEO/CFO/Director interviews John. They publish a half a dozen a week almost.